The situation in the area of the antiterrorist operation in Donbas remains tense, but controlled. Over the past day, militants 50 times opened fire on positions of Ukrainian servicemen, having wounded three Ukrainian soldiers, the press center of ATO reported on Facebook on 30 May. In the coastal sector, there were recorded 18 shelling attacks. The enemy employed heavy artillery systems to pound the positions of the Ukrainian forces stationed in Krasnohorivka and then switched to light weapons. From grenade launchers and small arms, Russia-backed terrorists repeatedly fired upon the ATO positions in the area of Pavlopil, Hnutove, Chermalyk, Novotroyitske, Taramchuk, Berezova, and Talakivka. In the area of Pavlopil, the enemy fired 82-mm mortars, and IFV weapons nearby Talakivka. In the Donetsk sector, militants shelled the ATO positions in the suburbs of Avdiyivka, using 120- and 82-mm mortars, grenade launchers, heavy machine guns and small arms. Also, Ukrainian strongpoints in the area of Luhanske on the Svetlodarska bulge have been repeatedly fired at from 82-mm mortars, infantry fighting vehicle and small infantry weapons. The mortars were fired at Zaitseve, Verkhnyotoretske and Piski. In the Luhansk sector, the enemy made 17 armed attacks. 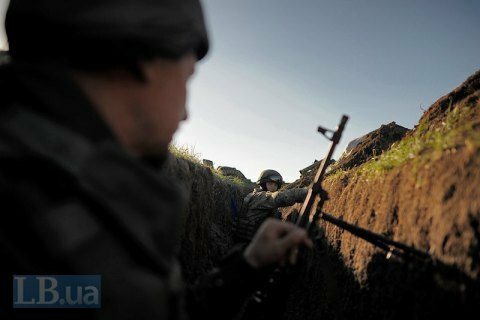 After 18:00 and until midnight, militants fired at ATO fighters stationed in Krymske, Novozvanivka, Novooleksandrivka, Katerinivka and Donetsk station, using mainly grenade launchers and small arms. Foreign Minister Pavlo Klimkin earlier called the OSCE the only institution that contributes to ending the aggression of Russia in Ukraine.